Want to connect with your client? Get it done with Studio il Punto – Your partner for marketing communications and events. Working on a product launch or a making your mission statement happen? Let’s find the best fit for what you’ve got. Who are your clients? How will you build a relationship? Choose the right mix of email, social, digital or print to build your brand. Real life connections bring selling opportunities and build community. Create the buzz and connections to meet your goals. 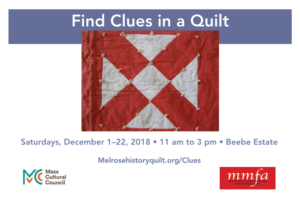 A community place shaping series to celebrate Melrose, MA Victorian history and the homecoming of a signature quilt. – Created and implemented a content marketing strategy with earned media, email and presentations to influencer groups. – Coordinated artists and volunteers to create a scavenger hunt highlighted by a “yarn storm” that raised awareness of local exhibits and events. – Developed interpretive content tied to the lives of the people whose names were on the signature quilt. – More than 300 people visited the Beebe Exhibit on Saturdays, with more at the First Friday reception and Open Studios. – Full attendance at the textile restorer’s presentation, which was filmed and available to stream on demand. A sculptor with a rich body of work seeks to provide a flexible way to communicate with collectors as they discuss commission and purchases. – Refreshed web site, implemented SEO. – Established photo, video and written library templates for storage and display of work. – Trained artist on how to use WordPress and create personalized portfolios to share with clients as they discuss his work. – Web site structure established with templates for tailored portfolios. – Structure to organize images and technical specifications of body of work. – Top ranking performance for primary key words.